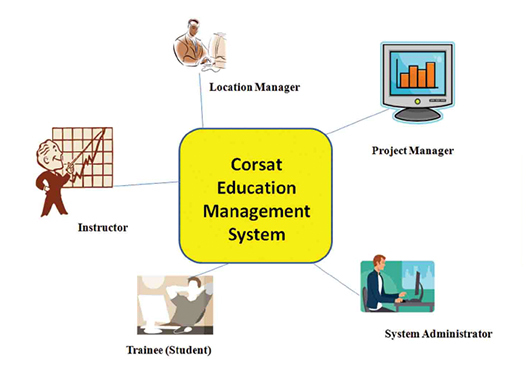 Corsat Education Management system (CEMS) manages education and training projects operated in different locations through a web-based interface to ensure that all stakeholders have access to the system. Equipped with a flexible user management system, CEMS has five main user roles: Administrator, Project Manager, Location Manager, Instructor and Trainee (student). While Administrator is responsible for basic data maintenance and system user's management, the Project Manager is the owner of the education project. He is the one responsible for setting up the data of his project by selecting them from lists that are already fed by the Administrator. The Project Manager sets up the unique data of his project and follows up the operations using the rich set of reports produced by the system. The Location Manager is the real operator of the system who is in charge of operations of his location, starting from location specific data to courses schedules, instructor's management, and trainee's management. Operational data of each course is entered by the Location Managers including actual start dates and end dates, grades, and attendance. Location Managers are also responsible for handling student's complaints. Instructors are responsible for entering student's grades and attendance while following up their schedules and evaluations entered by the students. Trainees (Students) have access to their schedules and grades. The system allows them to enter course evaluations and to send complaints to Location Managers. Many organizations have selected CEMS as their training management platform such as IBM, Fujitsu and the Supreme Council of Universities.